Entire Page, logo, and all material. Copyright 1997, 2014. Laurence C. Hatch. All Rights Reserved. 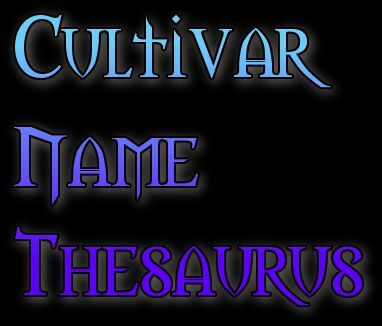 This page is a carefully written thesaurus to help developers of ornamental plants think up fresh and interesting cultivar names for their creations. We spent many hours with a favorite thesaurus, dictionary, word finder software, nursery catalogs, nursery websites, and cultivar checklists in the compilation of these lists. There was also about a dozen hours of fairly productive brainstorming in gardens, greenhouses, and even a zoo. Of course if you have a suggestion (or twenty) those are most welcome and will expand the page in the near future. Thanks in advance for your ideas. Kudos to thesaurs.com in 2013 for helping us augment the original file. Just browse the alternative adjectives and nouns and try a few in various combinations. For example you might pick a few terms from a color listing and combine them with words from another category for shape or form. The number of combinations is rather large. We hope you get an idea or two that may prove helpful. Please consult with a cultivar registrar or taxonomist in your area before naming any plants to avoid duplication of existing names, violating nomenclature codes, trademark infringements, and other problem areas. They will not charge for their services so it only costs your time to get it right. Call your local Cooperative Extension Service if you need help in finding a local expert on plant names. Lots of great plants have gotten ignored only because they were named with a misleading or existing name out of simple ignorance. Some of the following names may be trademarked in a particular plant group or in certain combinations with other words, so please research your chosen name(s) using both legal and scientific resources. Some people have spent thousands of dollars to patent and trademark new plants and they are not going to be very happy if you unknowingly reuse their name or use something confusingly close. We live in a big, complicated world and naming plants needs to be done with respect for other people and corporate identities; particularly if you plan to actively market your new plant. Tidbit, Bambino, Dainty, Liliput, Rosette. Summer Ice, Snow Wolf, Moon Eyes, Alibaster.